Navigation and editing are easier than ever in Sharm Studio. Commonly used commands are at the forefront, while more advanced tools are in the back. Enter precise parameters, draw graphs to control sound properties, or use auto-graphs to automatically change sound properties in real time. You can even set sound parameters and draw graphs while Sharm Studio plays the session. 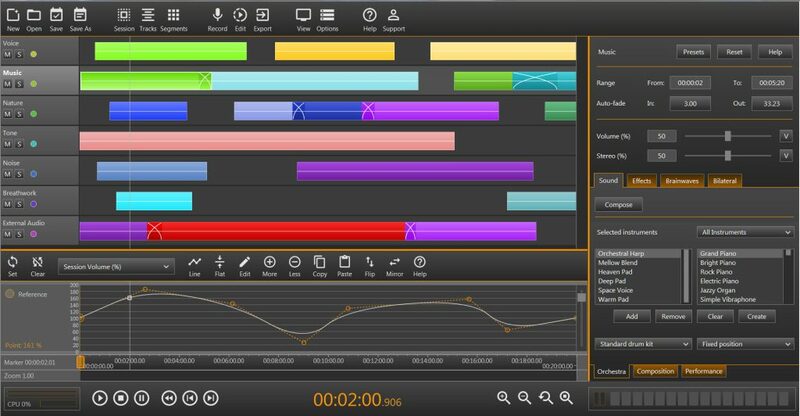 The graph editor is embedded in the main window for easy access and powerful control over the session timeline. The built-in sound recorder with a script recording option lets you create customize segments with one click—just open the recorder and press the Record button. Once your recording is completed, you can automatically insert it into a Voice segment in your session. You can set a script text in the script window and Sharm Studio will scroll and highlight the text while recording. Sharm Studio includes a built-in sound editor, which allows you to easily edit your recorded sound files. Cut, copy, paste and re-record problematic parts of your recordings. Zoom in to get precise results. The sound editor enables you to quickly correct mistakes, eliminating the need for “all in one shot” production and allowing you to enjoy a much easier and more efficient recording process. Sharm Studio includes a new, automatic ambient music composer, which allows you to create original, royalty-free music for commercial use. The process is amazingly simple: just select the musical instruments or let Sharm Studio select them for you. Then, control different musical aspects, such as dynamics, ambience, drums and tempo, with a slider or by drawing a graph. Sharm Studio completes the services that I provide to my clients. The time taken to produce a therapeutic recording to support clients between sessions has been reduced to minutes, rather than the hours it used to take. Sharm Studio is easy to learn and produces effective results. The features of the program include everything you need to help your clients and customers. The support is incredibly fast and efficient.